16d. After the Fact: Virginia, New York, and "The Federalist Papers"
The Federalist Papers were a series of essays by John Jay, Alexander Hamilton and James Madison written for the Federalist newspaper. America's first native sculptor, John Frazee, was unhappy with the amount of foreign artists doing work for the new Capitol. He was more than happy to do this very classical looking bust of John Jay. The debate in New York produced perhaps the most famous exploration of American political philosophy, now called The Federalist Papers. Originally, they were a series of 85 anonymous letters to newspapers, which were co-written by Alexander Hamilton, James Madison, and John Jay. Together they tried to assure the public of the two key points of the Federalist agenda. First, they explained that a strong government was needed for a variety of reasons, but especially if the United States was to be able to act effectively in foreign affairs. Second, it tried to convince readers that because of the "separation" of powers in the central government, there was little chance of the national government evolving into a tyrannical power. Instead of growing ever stronger, the separate branches would provide a "check and balance" against each other so that none could rise to complete dominance. 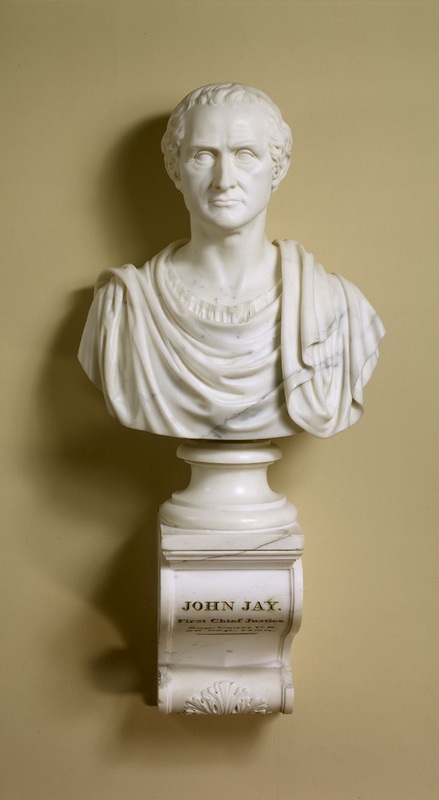 John Jay contributed to the Federalist Papers and was in charge of foreign affairs for the fledgling nation. This easily-navigable site has all of The Federalist Papers in their entirety. All of the papers where published anonymously, so why not try ignoring the names listed at the top of the pages and try to tell the difference between Hamilton, Madison and Jay. Be sure to read Paper No. 10, one of the most influential and important Papers. The U.S. Treasury offers a well-written short biography of the first Secretary of the Treasury. This bio details his fiscal policies and the his role in the development of the Treasury. The full text of the original act creating the U.S. Dept. of the Treasury. 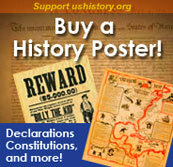 Read the Ratification of the Constitution by New York. Compare the conditions issued by the New York General Assembly to those issued by Virginia. This document is much longer than that of Virginia, and accordingly, the actual vote on ratification was much closer, meaning more compromises had to be made. Is there a "lost" amendment to the Constitution?